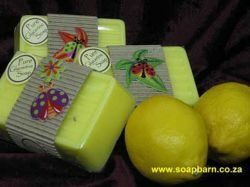 Ingredients: 1kg Yellow lemom cream farmhouse soap, 20ml Citronella essential oil, 1 Rectangle soap mould SB45, Cellophane METHOD: Gently melt your soap in the microwave or in a pot over a very low heat. Once the soap has melted add 20ml citronella essential oil. Leave the soap to cool till it has formed a skin on top. Then you know it is a good pouring temperature. Pour the soap into the mould and leave to set. Once the soap is un-moulded leave it a day or two to dry out then you can wrap it in cellophane. Use this soap in summer to protect yourself from mosquitoes and flies.